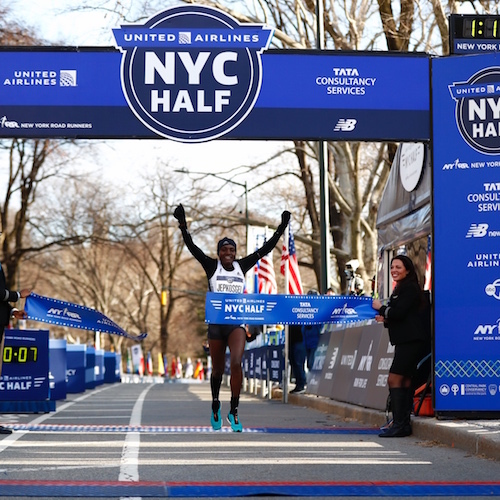 Joyciline Jepkosgei of Kenya won the NYC Half on Sunday morning in 1:10:07. Her victory was predictable, given that her half-marathon personal best of 1:04:51 is the world record. If anything, her performance suggests that the new NYC Half course isn’t particularly fast. In the end, the women with the faster PRs did prevail (except Kiplagat, who faded to finish in 1:13:18), but the race was much closer than their best times would have predicted. Ngugi was second in 1:11:07, Diriba third in the same time, Bates was fourth in 1:11:13—the only runner in the top eight to set a personal best, and Linden was fifth in 1:11:22. Taylor dropped to eighth, in 1:12:43. Beverly Ramos of Puerto Rico also ran well, finishing seventh in 1:12:33. A half-marathon in March, while many runners are deep into their marathon training, doesn’t tell us a lot. Linden has repeatedly shown that her half-marathon pace isn’t all that different than her marathon pace. We already knew Emma Bates was good and still getting better. Nevertheless, it was good to see some of the U.S. women mixing it up with runners who are faster on paper. And kudos to New York Road Runners for bringing in good fields and providing such thorough coverage of their own race. They made the event viewable on various social media platforms and their own website, brought in experienced commentators, tweeted mile splits, and provided bios of the top athletes (which is the only reason I can tell you anyone’s PR). It wasn’t perfect, but it was a really solid effort. I don’t want to use up too much space trying to explain the confusing, fan-unfriendly changes to the Olympic qualifying process the IAAF (track & field’s international governing body) announced last week, so instead I’ll point you to some resources. I don’t agree with the changes. The Olympic Games are about bringing together athletes from a wide variety of nations, and the changes limit opportunities for athletes from countries whose track & field teams aren’t as strong. For some, hitting the qualifying standards will mean establishing new national records. I think the changes are likely to affect the U.S. men in the distance events more than the women, simply because there are more women than men who have hit their respective standards in recent years. Of course no U.S. distance runners currently have the qualifying standards, because the qualifying window for the 10,000m and marathon opened January 1, 2019 and the window for the 5,000m and down doesn’t open until May 1. The worst part of all of this for U.S. distance runners is that the qualifying system was announced so late in the game, when many runners map out their plans years in advance. In an ideal world, U.S. athletes would hit the standards this year, so they’d only have to worry about finishing top three at next year’s Trials, but those who are currently injured or coming back from pregnancy might not have that luxury. This particularly affects the marathoners, because they have fewer opportunities to get it right. I think that quite a few U.S. women would have made different choices about whether or where they’d run their spring marathons, had they known about the new criteria in advance. I wouldn’t be surprised to see more marathoners squeezing in fall marathons before the Trials on February 29, 2020. And I wonder if USATF would have chosen a hilly course in Atlanta for the Trials had they known in advance that qualifiers would have to run 2:29:30 or faster (women), and 2:11:30 or faster (men). However, I think the U.S. middle-distance and distance women are mostly going to be just fine. Women’s running in the U.S. is strong enough right now that athletes were likely going to have to be capable of hitting those times to make the team anyway. The challenge is making sure they actually do it. Athletes either have to find the right opportunity to run a qualifier before the Trials, or they need to make sure that their Trials races are fast. I’ve lived through an era of U.S. track & field fandom during which our distance runners routinely had trouble hitting World Championships and Olympic standards. Remember the 2000 U.S. Olympic Marathon Trials? The worst part of that may have been trying to explain the what and why of it to casual followers of the sport. Tough standards lead to a lot of time-trialing (which tends to be less interesting than just racing) and then sometimes we don't end up with the three best-prepared athletes on World and Olympic teams. At the same time, we survived that era and came out stronger, just as I think we will survive this. Some athletes may still be experiencing some shock over the changes, but barring any dramatic turnarounds by the IAAF, they really have no choice but to shake it off, adjust plans as needed, and rise to the occasion. Fortunately I think we have a crew of U.S. women more prepared than ever before to do that. I do think that in light of the Olympic marathon standard moving from 2:45:00 to 2:29:30, the U.S. Olympic Marathon Trials standard for women is likely to get tougher in 2024. In 2016, the standard was set at 2:43:00, but when the Olympic standard of 2:45:00 was announced, USATF eased the Trials standard (two months out from the race), to avoid having it be harder than the Olympic qualifying time. But as of now, with the standard set at 2:45:00 in 2020, there are already 285 women qualified for the Trials with 10 months remaining in the qualifying window. Hosting the Trials is going to be expensive for the Atlanta Track Club, especially since they’re covering all qualifiers’ hotel and travel expenses. It’s easy to imagine a couple minutes coming off that standard in 2024. If the standard was lowered to 2:43 right now (which it won’t be; it’s set for 2020), we’d have 102 fewer qualifiers and a more manageable field. Carly Gill said in this Tempo Journal piece, “Make the standard 2:43...make it 2:40, we’ll still chase it...It’s not easy. Women are just transcending." This is both awesome and a strain on resources. David Monti pointed out last week that at the 2020 Trials, the personal bottle service alone will be daunting. USATF’s women’s long distance running committee has always seemed to appreciate the value of having an inclusive Olympic Trials, as the women’s standard has been equivalently easier than the men’s, which has led to more qualifiers on the women’s side. I would argue that’s part of the reason women’s distance running in the U.S. is thriving as much as it is right now. So while I don’t have a lot of faith in certain leaders in our sport in light of the recent announcements and developments, I still have faith in the women’s long distance running committee. I’m hopeful that though the qualifying standard is likely to go lower in 2024, that it won’t go so low that it discourages our up-and-coming runners from trying at all. As competitive as Sunday’s NYC Half was, it wasn’t even close to being the fastest half-marathon of the weekend. Brigid Kosgei ran 1:05:28 in winning the Bahrain Night Half Marathon (results) and Vivian Cheruiyot won the Lisbon Half Marathon in 1:06:34 (results). Roberta Groner, 41, won the USA Masters 8K Championships in Virginia Beach on Saturday in 26:48, and 55-year-old Marisa Sutera Strange finished second in 30:37. Groner is three weeks out from running the Rotterdam Marathon. Jordan Hasay won the Shamrock Run 15K in Portland, Oregon, in 51:32 (chip time), which is 5:31 pace overall. Her five-mile split was 29:01, which means she picked up the pace significantly after that point. Dan Cruz tweeted that she did a long cooldown to hit 23 miles for the day. Hasay is four weeks out from her return to the Boston Marathon. Caster Semenya ran a 4:14/16:11 1500m/5,000m double this weekend. She may have been using the event as training, or maybe she’s covering her bases, in case the IAAF ruling, which, last I heard, is expected by March 26, doesn’t go her way. The IAAF’s decision will reportedly only apply in events from 400m to the mile. Kara Goucher announced that she’ll run the Leadville Trail Marathon June 15. Lisa Jhung writes that Goucher is tentative on trails, but there’s appeal in taking on a new challenge. Lindsey Hein’s latest episode of I’ll Have Another is with Marielle Hall. Hall is the perfect example of a U.S. runner who deserves far more attention than she receives, so I appreciated this episode. And I can’t wait for the Hall family podcast to come out! Sarah Gearheart profiles 1:05:04 half-marathoner Joan Chelimo for espnW, and it’s a good read. Chelimo had a baby in 2015, which made her more determined to use running to help herself and her daughter, and eventually all of the women and girls in her village in Kenya. A good blog entry from Brittany Charboneau (with both text and audio options) about how she’s adjusted her nutrition to better fuel her running. Charboneau finished 11th at the NYC Half in 1:13:38, and she pointed out that that’s about a minute per mile faster than she ran the race two years ago. The BBC interviews Athing Mu. The B.A.A. announced last week that Joan Benoit Samuelson will run the 2019 Boston Marathon 40 years after her first Boston Marathon victory. Samuelson won the 1979 race as a 21-year-old Bowdoin College student in 2:35:15. She hopes to run the 2019 race within 40 minutes of her 1979 time, which would mean a 3:15:15 or faster. Sarah Wassner Flynn wrote a good profile of Jenny Simpson for Women’s Running. Simpson says being in her 30s suits her well, since she had much of the responsibility and maturity of an adult well before she became one. Sara Vaughn, who was a 2017 World Championships semifinalist in the 1500m announced that she’s expecting her fourth child in September. Vaughn kicked past six women on the last lap of the 2017 USA Track & Field Championships to unexpectedly grab a spot on the World team. Olympic Dreams, starring Alexi Pappas, premiered at South by Southwest last week and is getting solid reviews. Allie Kieffer concedes that her racing season is over for now, and she will not run the London Marathon. Foot Locker Cross Country champion Sydney Masciarelli just wrapped up a great basketball season, and now she’ll run outdoor track. Masciarelli said it was hard at times to see her peers posting fast times over the winter, but she also appreciated the down time. Given what we hear about the negatives of early sport specialization, it’s great to see a young, successful runner continuing to do all of the sports she enjoys. Anna Weber wrote a good explanation of the importance of maintaining appropriate ferritin, hemoglobin, and iron levels as a runner. Though deficiency can happen to all runners, it’s a problem that disproportionately affects women. And while I think a lot of runners who come up through high school and college teams are aware of these issues, I find that many women who take up running as adults are not as aware. Amy Cragg and Diane Nukuri will run the Prague Half Marathon April 6. The announcement describes the race as a potential American record attempt for Cragg. Her half-marathon personal best is 1:08:27 and the record is Molly Huddle’s 1:07:25. Natasha Cockram of the UK writes about choosing a U.S. university or college (with emphasis on its running program). It seems that she did not have the most positive experience running in the U.S., but out of it comes some advice that can be used by all runners seeking out collegiate running opportunities. Kara Goucher recorded this episode of the Feminists Ruin Everything podcast last summer, but it was just released. I enjoyed hearing Goucher speak her mind, including describing negotiating an appearance fee in her prime after hearing that there was a man who was getting more. Goucher also talks about the first time a marathon didn’t want her (presumably that they weren’t willing to offer her an appearance fee). Deena Kastor figured she’d run between 2:30 and 2:45 at the Tokyo Marathon, but rough conditions, two falls, and a bathroom stop slowed her down. Hailey Middlebrook writes about the tools Kastor used to persevere and make it to the finish line in 2:51:58. Taylor Dutch writes about Olympic 1500m runner Malindi Elmore’s surprise return to competitive running, highlighted by a 2:32:15 marathon in Houston in January. Elmore transitioned to triathlon when she had injury issues after the birth of her first child, then she moved back to focusing on running after her second child was born, because it was less time consuming. Esther Atkins will participate in the 2020 U.S. Olympic Marathon Trials both as an athlete and a coach. She qualified for the event, her third Marathon Trials, with a 2:36:32 at the 2018 California International Marathon, and she’ll be coaching her husband, Cole, who qualified at the Houston Marathon in January. This was an interesting update on Catherine Ndereba, who held the marathon world record, and won the World Championships marathon twice and the Boston Marathon three times. She says she still runs a little, but she injured her foot when she was attacked in 2015, and it’s still problematic. There are always lots of interesting events taking place around the Boston Marathon, but this one in particular caught my attention. Adrianne Haslet will moderate a discussion with Julia Chase-Brand, Bobbi Gibb, Cheryl Treworgy, and Patti Catalano Dillon. Anyone who has turned on a television recently already knows this on some level, but the statistics in this article about the inequity in the coverage of women’s sports are still mind-blowing. Forty percent of sports participants are women, but they received only three to four percent of media coverage, and only one to two percent of the airtime on networks such as ESPN and Fox Sports. My first year out of college, I interned at the Women’s Sports Foundation. Working there meant knowing the history of Title IX, and therefore knowing the name Birch Bayh. The former U.S. senator from Indiana, who wrote and introduced Title IX, died last week at age 91. Emma Coburn’s cake-baking skills finally get the attention they deserve, though I don’t think the turtle was even her best work. Thanks for reading. For more content throughout the week, follow Fast Women on Twitter. And I always appreciate any efforts to spread the word about subscribing to this newsletter.